The first thing you need to complete in order to apply for the J-1 Visa is the DS-160 Form. You can complete this form here. You will need to submit the DS-160 Form, your DS-2019 Form, SEVIS receipt and passport to the U.S. Embassy or Consulate in your home country in order to schedule a visa appointment. Please consult with your International Cooperator or the embassy’s website to determine if there are other forms you may need to submit with your application, as requirements vary by country. The DS-2019 Form is your proof of sponsorship. This is the form that allows you to legally work in the United States (provided that you also have a valid J-1 Visa) for a specified period of time. It is also the form that determines how long you can work and stay in the U.S. 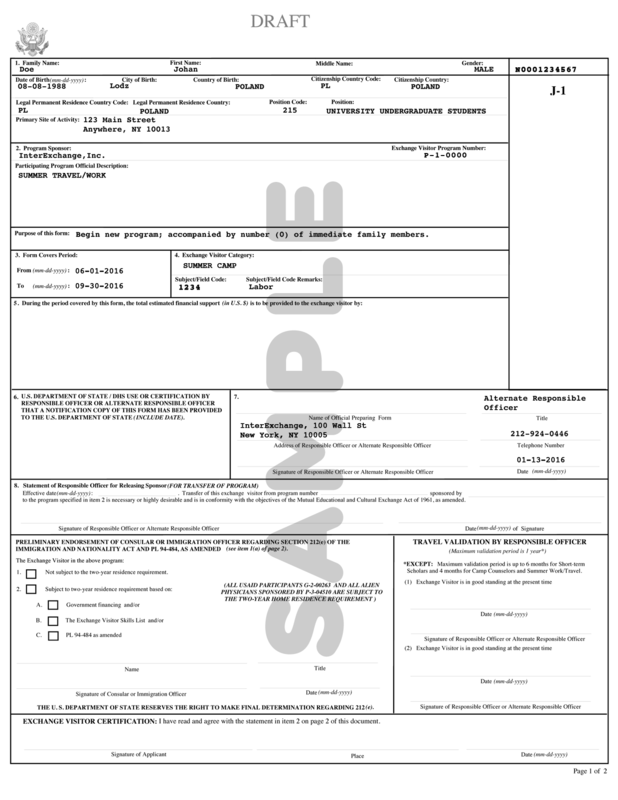 Note: About halfway down your DS-2019 Form, you will find a section labeled with the number “3.” Two dates will be printed in this section. These are the dates that you may begin and end your work commitment in the U.S. You are allowed to travel in the United States for 30 days beyond the end date listed in this section. Please check these dates and all other personal information thoroughly and let us know immediately if you have any questions or concerns or if there are any mistakes. You are eligible to work only with a valid DS-2019 Form and only between the dates listed in Section 3 of the DS-2019 Form. You will need your SEVIS Receipt (I-901 Form) in order to apply for your J-1 Visa. The U.S. Department of Homeland Security requires all applicants to pay this fee before the Department of State issues them a visa. This SEVIS fee is included in your InterExchange program fees, and we will send you your SEVIS Receipt in the same shipment that we send your DS-2019 form. After you receive your visa, in most cases, you will not be asked to show your SEVIS fee receipt at the border. However, we recommend that you carry your receipt with you in case the inspector has questions at your port of entry. If you’ve lost your SEVIS receipt, you can print a new one here. When you get your passport back from the embassy, hopefully you will have received your J-1 Visa! The visa is the document that allows you to enter the United States and explains why you are in the country. The J-1 Visa is an Exchange Visitor Visa, sponsored by InterExchange. InterExchange is your sponsor for visiting the U.S. No one except InterExchange or a U.S. government agency has the authority to cancel your visa. 1. Entries. Under this heading, there will either be the number “1” or the letter “M.” If your visa has the number “1,” it is a Single Entry Visa. This means you can only enter the United States one time. Once you have entered the U.S., you may not exit and re-enter the country again for the duration of the program. If your visa has the letter “M,” it is a Multiple Entry Visa and it allows you to enter the U.S. several times. You could, for example, go to Canada during a weekend off and re-enter the United States. You should not plan on leaving and re-entering the United States during the 30-day travel period. 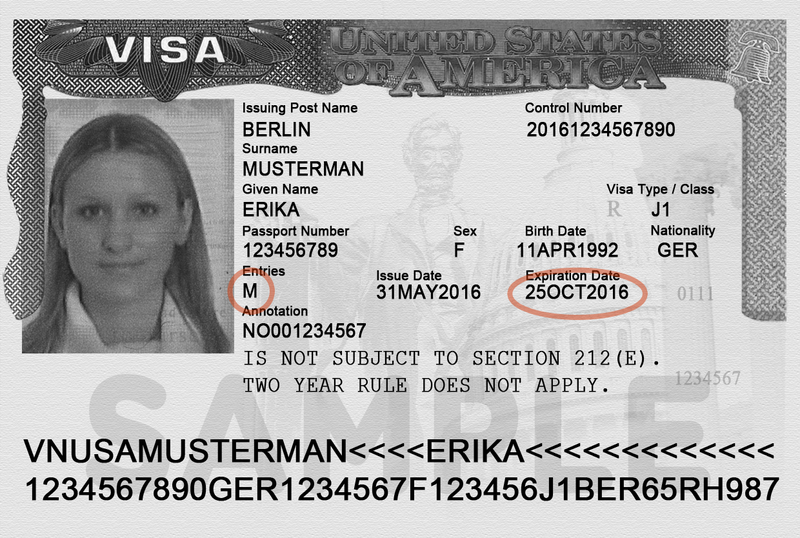 Important: If you have an “M” Multiple Entry visa and you plan to travel outside the U.S. and return, you must re-enter the U.S. before the expiration date on your visa and have your DS-2019 Form signed by InterExchange. Please note that, depending on your home country, you may be required to obtain a visa to travel to Mexico or Canada. Please contact the Mexican or Canadian consulate for information. 2. The expiration date. You are only allowed to enter the U.S. until the expiration date stamped on your J-1 Visa (even if it is multiple entry) or until the end date of your DS-2019 Form, whichever is earlier. Work for any employer other than the camp at which you were placed or obtain a second job. Remember: The J-1 Visa on its own does not give you the right to work or stay in the U.S. The J-1 Visa is only valid with the appropriate DS-2019 Form. You must return home within 30 days of your last day of work. InterExchange Camp USA will report all participants who do not return home to the U.S. Department of State and to their home countries’ embassies. J-1 Visas issued by U.S. Embassies in some countries may have an expiration date that is later than the end date of this program. For example, you may find that the embassy has given you a visa that expires in two years, instead of four months. This does not allow you to stay in the U.S. for longer than the duration of our Camp USA program, which is indicated on your DS-2019 Form. Instead, it means that if you want to come back to camp next year, you may not have to apply to the U.S. Embassy/Consulate for a new J-1 Visa. However, you will still need to get a new DS-2019 Form. The J-1 Visa is not valid without a DS-2019 Form. Some countries also have early end dates. Please be sure you know when you need to return to your country. The U.S. Customs and Border Protection (CBP) will document your arrival upon entry to the United States by sea or plane through your electronic I-94 record (DHS Arrival/Departure Record). Participants arriving by car (most common with Canadian or Mexican participants) will still be given a paper copy of this document. To record your entry in the U.S. the Immigration official will stamp your passport. The admission stamp will have information about your date of entry, visa type and duration of your stay (D/S) in the U.S. The immigration official may stamp your DS-2019 Form as well. The U.S. Customs and Border Protection (CBP) will make your electronic I-94 record available at: http://i94.cbp.dhs.gov. We recommend you access and print your electronic I-94 record by entering the information below. It is located on your J-1 Visa stamp and you should keep this printed copy with you when applying for important documents like your Social Security Number or other forms of identification in the U.S. Date of entry in the U.S. If you are not able to access your I-94 record online, you may need to wait a few more days for the CBP to process your arrival information. If this occurs, please check back periodically and reference the How to Use the Website and Questions/Complaints section on the website, or contact the CBP office directly. The CBP will record your departure from the U.S. using information gathered at the time of your arrival into the U.S.; you do not need to present your printed I-94 record when leaving the U.S.